If there’s anyone who knows anything about entrepreneurship, it would be Adam and Matthew Toren. The brothers are the founders of leading entrepreneur community and website YoungEntrepreneur.com, and have themselves started, operated, turned around and sold off various businesses such as a billiards parlor, a printing company as well as a media and publishing company. And having interacted with so many other amazing entrepreneurs – including Gary Whitehill of New York Entrepreneur Week – it’s perhaps unsurprising that they’ve come up with a book, “Small Business, Big Vision: Lessons on How to Dominate Your Market from Self-Made Entrepreneurs Who Did it Right“. 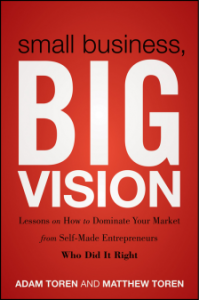 For a book that emblazons the words “Big Vision” across the front cover, “Small Business, Big Vision” interestingly doesn’t exactly focus too much on it. Sure, the first chapter of the book highlights the importance to an entrepreneur of having a big vision for their business, but the rest of the book looks more at the nuts and bolts of running a small business. Which, to me, is a good thing. There’s valuable advice in there that, for example, examines the need for investors, how to leverage social media, looks at the good and bad of hiring employees and freelancers, and even how to position oneself as a subject matter expert. It’s all great material, but you can’t help but wish that there was a lot more to each chapter… simply because it makes really useful reading. My favorite chapter would be the one about rethinking what it means to have a business plan. But where “Small Business, Big Vision” really shines is in the interviews compiled by the Torens with various leading entrepreneurs such as Gary Vaynerchuck of Wine Library TV fame, Anita Campbell of Small Business Trends and BizSugar.com, and Mike Michalowicz of “The Toilet Paper Entrepreneur“, who weigh in on their individual areas of expertise in a section called “Entrepreneurial Profiles” at the end of each chapter. These mini-sections are a great insight on how these thought leaders would approach problems or opportunities. Of course, some of the ideas in “Small Business, Big Vision” aren’t totally new, especially if you already follow YoungEntrepreneur.com keenly. But for the new small business entrepreneur, this book is a handy, easy-to-read, and useful tome to start you off thinking how you can tweak your own business for the better.